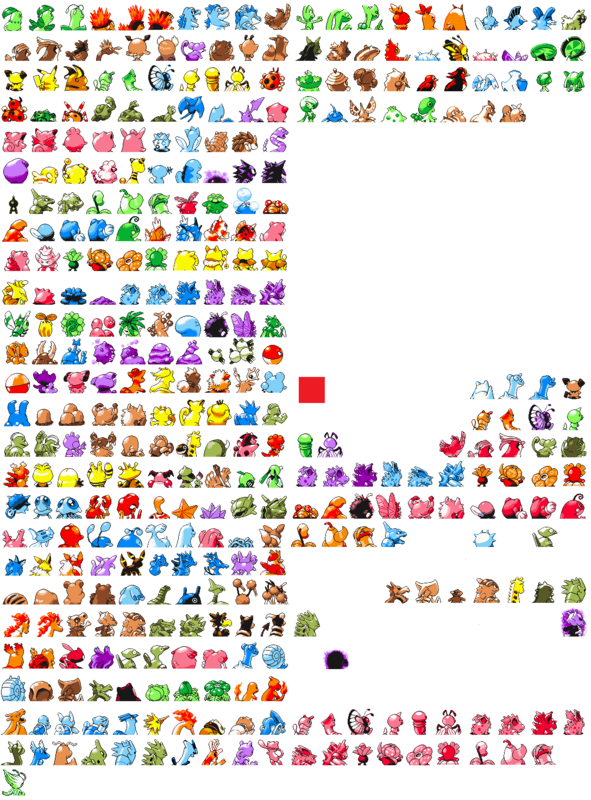 I'm currently trying to reproduce all Pokemon and trainers in the style of Pokemon Yellow, mostly using Gen III sprites as a base for my work (the 64x64 sprite resources over at pokecommunity are my main sources for this and have been a great help). I've been working on this for many years, originally in the style of Gen III trying to collect all the Pokemon and forms to have existed in the main series games as well as in the anime and manga adaptations. I've recently moved over to Gen I style, editing the sprites myself, with back sprites being in the style of GSC. I will try to keep updates to this thread regular, by the end of this project I aim to have all seven regions Pokemon complete. The Jynx and Smoochum sprites are meant to be a two layer sprite, for if black or purple is wanted. I don't know if it's possible to do but the idea would be to layer the purple pallet sprite over the original sprite to create the illusion of a five colour sprite like in the DS re-release of Pokemon Yellow. It might help if you included a roster; a list of the names/proposed names for them for the sake of clarity. I recognize several of the "proposed" pokemon, several Betas, and several of the made-up pokemon, but some I don't and it'd be nice to be able to ID and reference some of them. 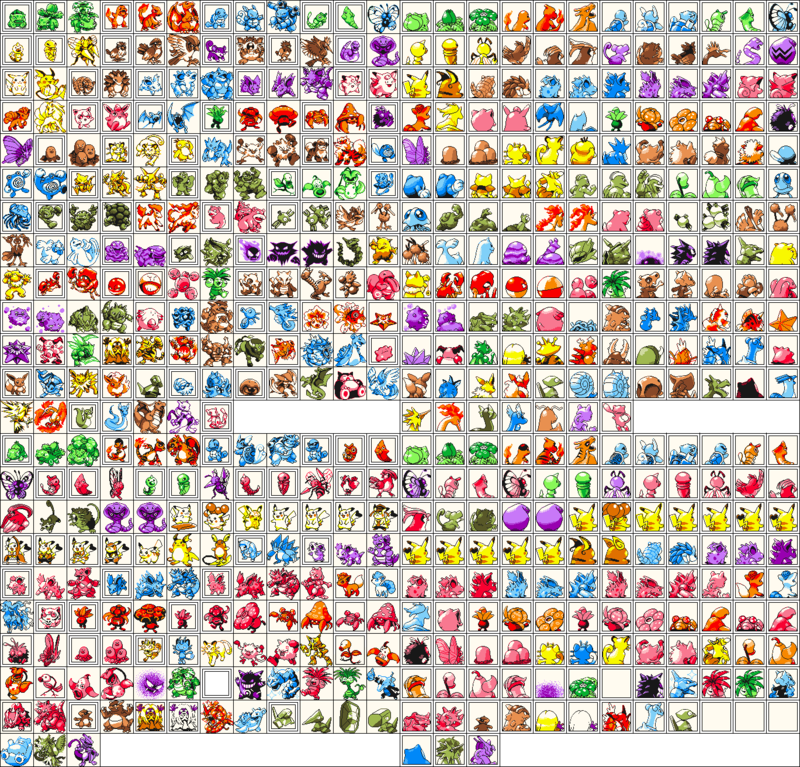 I'm planning to write up pokedex entries and stats for them as soon as possible, just swamped between sprites. Kanto is officially finished. I realise Leaf's backsprite and Duplica and Samurai aren't as good as they could be so I will probably update these at some point. I didn't feel dress up Pikachu was really worth adding to the alternates, I personally feel they were unnecessary but if anyone in the community would like them I'll update this with further sprite additions, feel free to put forward requests. When do you think you can take care of my other Yellow-style sprite requests? Johto is finally finished. I think this is both my quickest and best work so far. 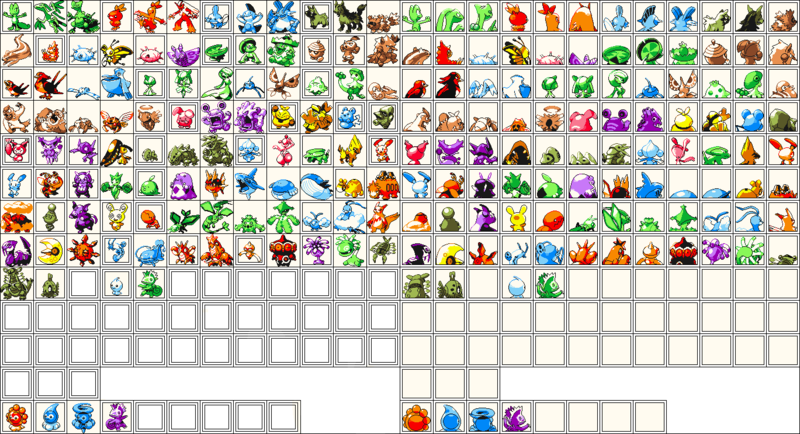 I should have backsprites up for Kanto, Johto and maybe Orange by the end of next week at which point I'll continue work on Gen III (I'm about 10 pokemon in). 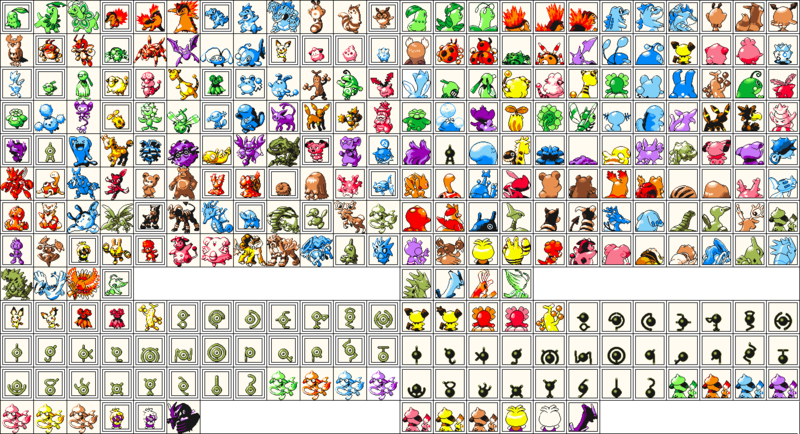 I'm sorry I have no interest in making none pokemon sprites, I'm making this more as a resource for the community to find quick pokemon and trainer sprites. Maybe when I've finished the world of pokemon I'll take requests for things like this. Wow, these are well-thought-out! You've got the ancient Alakazam and Gengar from the anime, Crystal Onix, baby Kangaskhan, the new Sun/Moon Pokémon... May I please use the Flying and Surfing Pikachu sprites for my Polished Crystal hack? I'll give you credit. Feel free :) Although I have some sprites for them on my laptop in more of a gold style if you'd prefer? Those look great! Could I use the Giovanni one please for my Crystal hack? I was going to use the standard Yellow one for my hack, but I like that one with Persian. Again, I'll give you credit. Gio is one of my favourites and I'd love to see it in game, let me know when there's a beta/game! If you have more GSC-style sprites, that would be great, thank you. I've updated the first post to include all currently complete spprites. I'll be updating the post later tonight with the progress made on Hoenn. Progress was slowed greatly when I began organising the sprites, many of the backs and fronts didn't match in pallete and there were extra blacks and whites all over the place, as well as a few with extra colours completely. I think I've just about met my match in the Cosplay Pikachu backsprites as well as in Haunters Black Fog form, if there's any talented spriters here who could help with that it would be greatly appreciated, even if it's in a gen III-V style it would still be a better start than none. 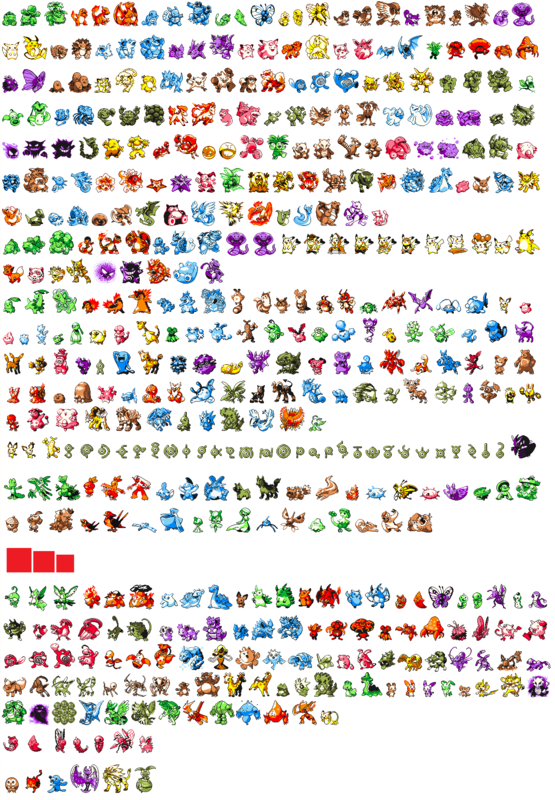 Update: I've added the Alolan forms to Kanto's sprite list as well as a few extra sprites to Hoenn. Side note, I was hoping to add Haunter's Black Fog form and the baby pokemon seen here and here, however I'm struggling with the sprites and was hoping maybe someone in the community could help out? I only really need a base to work from. I feel the project would be incomplete without them. Also I imagine with enough attempts I can successfully create sword and hammer Porygon's back sprite but could do with help on the shield form. 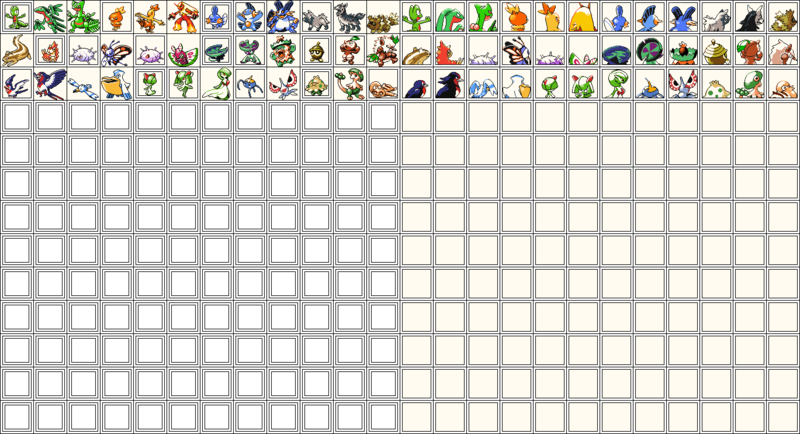 By the end of this next week I aim to have both Pokemon and Trainer sprites complete up to the end of Hoenn. I'm working on updating this to be a complete R/B/G, Yellow and G/S (if I can find the artists to help create the extra frames than hopefully G/S/C) resource. I've been currently updating my backsprites to more accurately reflect the G/S/C style. Here's a sneak preview of current progress. Let me know your thoughts. 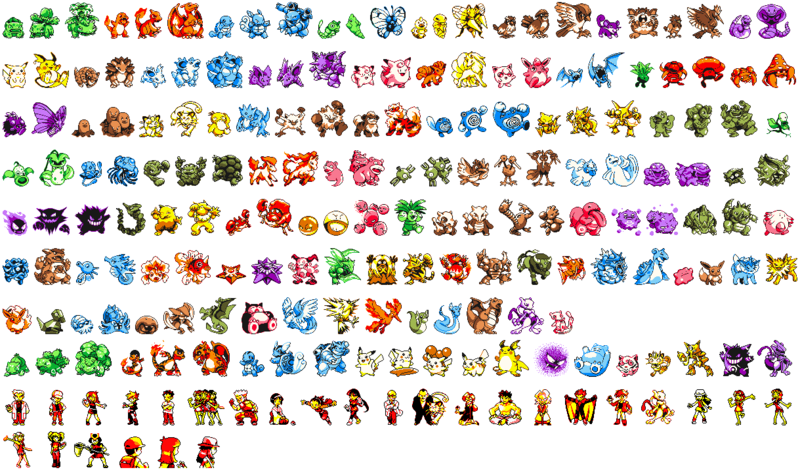 Credits for G/S style front sprites belong to Blue Emerald. I think these look really good. The only thing I would point out is that Lotad/Lombre's palettes look off. They're too dark purple-y, in my opinion. Thanks for the feedback! I took the palette straight from Blue Emeralds front sprite, I see what you mean though. I'll be sure to have a think about the palette and get back to it. What Are These Mons Between Hoenn And Alola?